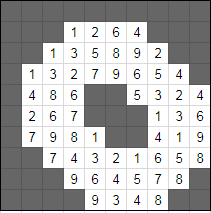 This puzzle sort of looks like a kakuro puzzle but there doesn't seem to be any sums. 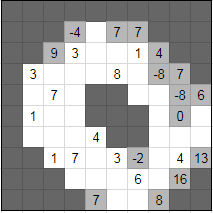 Figure out how this puzzle works and solve the kakuro. 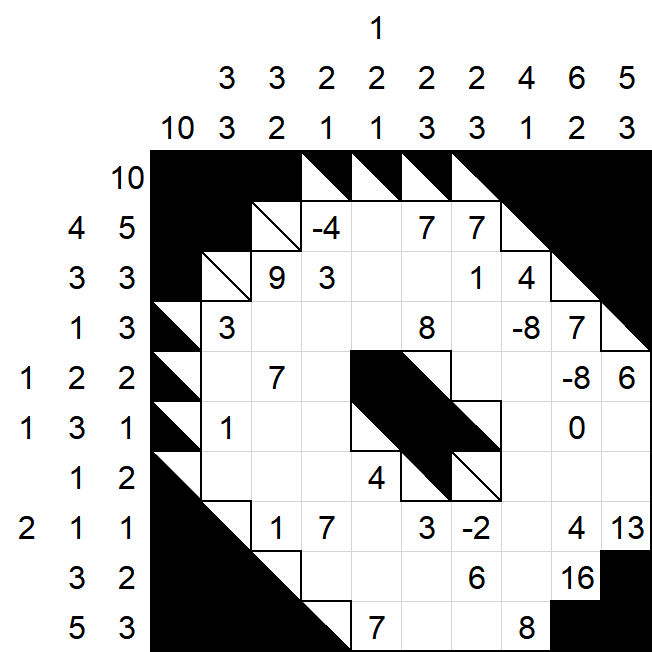 This puzzle is similar in concept to my Unusual Sudoku Puzzle involving three different grid-deduction puzzles. Edit: Now I'm really mad at myself because I made another transcription error. I left out an 8 from the grid. The thing I was double checking against was missing it too. This time I can guarantee that it is solvable. From the Fillomino, we can add the cells together in each entry to figure out the clues. As promised, here is the logical solution to the kakuro. Let's start with notation for possible combinations to make things easier. 8(3): (1)25, (1)34 will mean the sum of 8 over 3 cells where one cell is known to be a 1 is 125 or 134. The hardest part of the entire puzzle is finding the beginning. In this case, I made it really hard and in retrospect probably unfair especially with nothing to go off of. Anyway the start is at the bottom. If we add the bottom two rows and the green cells we should get the same result as the middle three columns and the blue cells. This gives us the following equation. $$39+24+G = 19+9+10+B \implies B-G = 25$$ This is a big number for the difference of two groups of four cells. In fact, the minimum for $G$ is $1+2+3+1=7$ and the maximum for $B$ is $9+8+7+8=32$ (note that the column 36 is 36(8): 12345678 which means that the repeated number can't be a 9). These values give are the intended difference as $32-7=25$. 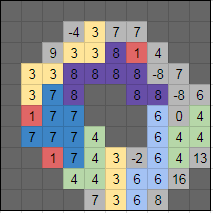 This allows us to fill in the repeated 1 and 8. We also know the 7 must go above the 8 since it can't be 8 or 9. We can rule out the 9 from the 23 column as the combinations are 23(6): 123458, 123467 and fill in the 8 and 9 in row 39. Continuing, row 39 is 39(6): 456(789) which leaves us with 456 in the middle cells. If we take the maximum numbers in column 19, we get $19-1-3-6=9$ left which goes in the last cell. Column 9 gives 9(3): 135, 234 as the remaining possibilities. 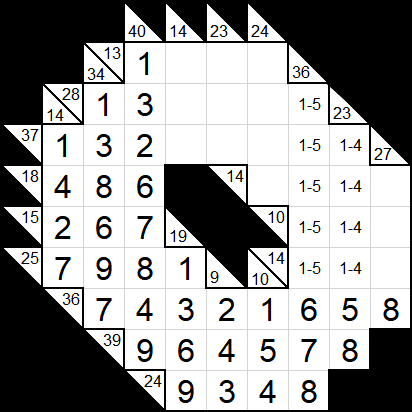 The high number goes in the middle and low number goes in the top leaving the 3 for the bottom. We can complete row 24 with a 4 in column 10. We can finish column 10 as we already have a 4. This gives us column 9. Now let's shift focus to the left. Row 25 is 25(4): 1789 and we can determine where the 9 goes as column 14 is 14(4): 1238, 1247 with no 9. This leaves us with two possibilities for 7 and 8. Let's put one on top and the other on bottom. The 3 or 4 must be in row 18 as it is 18(3): 378, 468. We can reduce row 18 to two possibilities by eliminating from column 40. 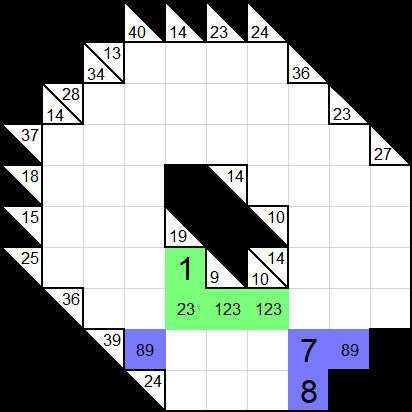 Row 15 also has two possibilities of 15(3): 168, 267. Now let's see if we can fill in row 36. 36 is 36(8): 12345678 or all but 9. Looking at column 40 (40(8): 12346789) 5 is not possible, 123 is already in the row, and 6789 is in the column. This leaves 4. Next, the far right is the only cell that can be 8. The 7 can only go in the far left and column 23. Column 23 is 23(6): 123458 which rules out the 7. Instead, 5 goes in this column. Which leaves 6 in column 36. Now back to the left. The top numbers are ruled out by the 7 in row 36. Row 36 is now 34(6): 13(6789) with 1 at the top and 3 below. Now we know the top of 40 is 132. Row 37 is 37(8): (123)45679. So, the end must be 5 then 4 with the middle three being a permutation of 679. Column 27 is 27(4): 37(8)9, 46(8)9. Both cases have a 9 which must go in row 14(3). Next, row 10 is 10(3): 127, 136 meaning that 6 or 7 goes in column 27. We can again split these possibilities to the top and bottom of the cell. We can then split both 14 rows to match. From here, we notice that the bottom row doesn't have a 3 in column 36. This forces the top row. Row 14(4) becomes 14(4): 12(4)7, 13(4)6, 23(4)5 giving 567 for the left cell. Moving to the top, column 23 is 23(3): 689 and row 13 is 13(4): (1)246. This makes the intersections 6. 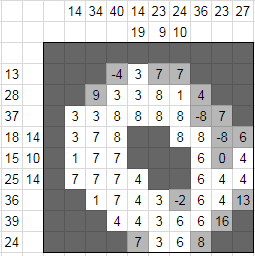 We can now eliminated the 6s from column 23 making 9 on the bottom and 8 in the middle. Column 14 is 14(3): 257 which gives 257 in that order. We now know the 4 and 6 in column 24 by their rows. Row 28 becomes 28(6): (1358)29, (1358)47. Column 24 is now 24(4): (46)59. A 2 goes in tow 28. Forcing a 4 in column 36 and a 1 in row 14(3). Then, 23 in column 23. We finish with a 31 in column 36. Yay! We're done. Not the answer you're looking for? Browse other questions tagged enigmatic-puzzle grid-deduction or ask your own question.